One glance at the well-heeled, designer-clad Milanese and you’ll know why Milan is arguably the world’s most fashionable city, giving the Parisians a run for their money. The streets are catwalks in and of themselves! Join your private, English-speaking guide from Italy’s Best for a private Milan fashion tour of this vibrant, bustling city. This tour brings you through Milan’s fashion district, also dubbed Quadrilatero della Moda, or Quadrilatero d’Oro (golden rectangle), a neighborhood lined with elegant 17th century architecture and comprised of the city’s four most prestigious fashion streets: Montenapoleone, Via della Spiga, Via Sant’Andrea and Via Manzoni. 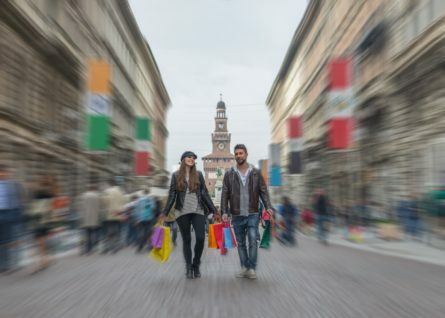 Start on Via della Spiga, a pedestrian only street where you’ll see an array of high fashion stores such as Sergio Rossi, Tod’s and Dolce & Gabbana then head down Via Sant’Andrea to see the likes of Chanel, Miu Miu and Fendi, and then take a turn onto Via Montenapoleone – the pulse of Milan’s fashion rectangle. Your guide will tell you about all of the luxury designers such as Bulgari, Gucci, Versace and Louis Vuitton as you make your way down the street. Next, stroll past the beautiful buildings and swanky boutiques on Via Manzoni, and then pass through Piazza della Scala to enter the Galleria Vittorio Emanuele II, a 19th-century glass-covered arcade flanked with shops and cafes that houses an integral piece of fashion history: the original Prada store from 1913. Following the tour, stop for a coffee in the Gucci Caffe. Sit back, relax and people watch! If you’re looking to shop ‘till you drop without breaking the bank, your guide can provide you with some helpful leads to second hand consignment shops. Note: This Milan Fashion tour is not a personal shopping experience but if that’s something you’re interested in, contact us to arrange it for you.